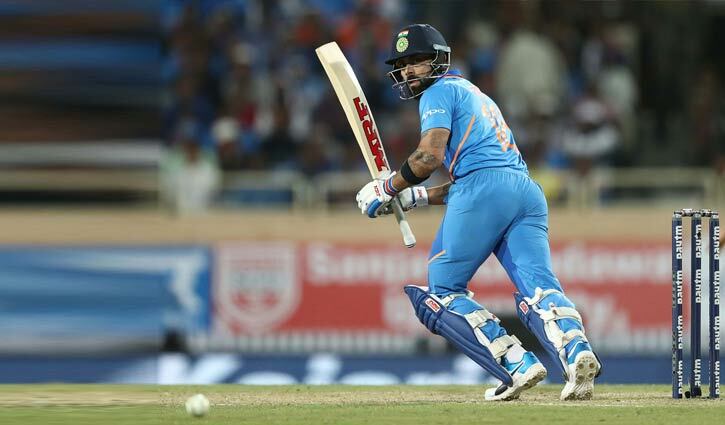 Sports Desk: Virat Kohli brought up his 41st One-day International (ODI) hundred and second of the ongoing five-match series against Australia in Ranchi on Friday. The flamboyant captain raised his bat to acknowledge the applause from the crowd and the dressing room as he brought up his eighth century against Australia. Kohli, who brought up his third ODI hundred of 2019 against Australia, now has the most centuries in the 50-over games between the two countries played in India. The record was previously held by Sachin Tendulkar. During his knock, Kohli added another accolade to his already illustrious career as the Indian captain reached 4000 runs as skipper during the third ODI encounter. Kohli became the 12th ODI skipper to reach this landmark and also the fourth India skipper after MS Dhoni (6641), Mohammad Azharuddin (5239) & Sourav Ganguly (5104) to score 4000 runs as captain in this format. Kohli slammed his 40th ODI century in the second game of the five-ODI series in Nagpur. The Indian captain also became the second cricketer ever to score 40 centuries in this format of the game along with Sachin Tendulkar (49). Kohli looked completely in control against the Australia bowlers and in the process, was able to score his 18th century in ODIs as skipper. Currently, he is only second to former Australia skipper Ricky Ponting (22). Earlier, Usman Khawaja smashed his maiden one-day international century to guide Australia to 313/5 . The tourists rode on a 193-run opening stand between Khawaja, who hit 104, and skipper Aaron Finch, who made 93, to put up a challenging total after being put into bat first in Ranchi.